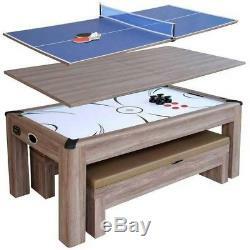 Driftwood NG1137H 7-ft Air Hockey Table Tennis Combo Set w/Benches. 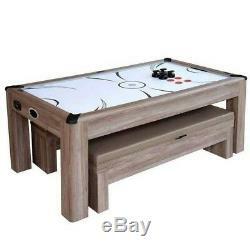 The multi-functional Driftwood 7-ft Air Hockey Table Combo Set delivers 3 great uses in handsome style. The Driftwood is crafted from sturdy, CARB certified, MDF material, featuring clean lines covered in a beautiful Driftwood melamine that enhances the tables overall look. The Driftwood is easily converted from a dining or a craft table, to a full blown competitive table tennis or air hockey table. The super-slick play surface, electronic scoring, and competition air blower system deliver lively accurate air hockey table play. The Driftwood comes with 2 soft padded bench seats that provide comfortable, convenient seating while keeping your game accessories organized and out of the way when not in use. Each bench features built-in lined storage, with hydraulic EZ-lifters, that make effortless work of opening and closing the bench seat. 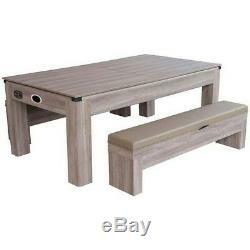 Add this great 3-in-1 Driftwood Combo Set to your entertaining area today for years of gaming fun! Driftwood Combo Game Table Features and Specs. Table dimensions: 84-in L x 47-in W x 32-in H; Bench dimensions: 67-in W x 12-5/8-in D x 19-in H. Constructed from sturdy CARB certified MDF material covered in a durable melamine material. 3-in-1 multi-functional table features reversible 2-piece dining/table tennis top for quick change over. Dual goal boxes with built-in automatic puck return system. Premium-grade, high output, UL approved 120V/60mz blower system for superior speed and performance. High-gloss, poly-sealed, scratch-resistant, high speed playing surface. Unique in-rail electronic scoring display. 2-piece (84"L x 47"W x 5/8 thick) table top - one side with Driftwood PVC laminate, other side with Blue PVC laminate. PLEASE NO APO or PO BOX ADDRESSES!!! Please check your order before the carrier leaves your home. Items must arrive in resellable condition in the original packaging. Items that do not meet these requirement may be refused. Orders must be cancelled within 2 hours of ordering. Terms subject to change in the future. WARNING: This product can expose you to chemicals including nickel which are known to the State of California to cause cancer and birth defects or other reproductive harm. Proposition 65 notice for wood products is as follows: WARNING: Drilling, sawing, sanding or machining wood products generates wood dust, a substance known to the State of California to cause cancer. Use a respirator or other safeguards to avoid inhaling wood dust. 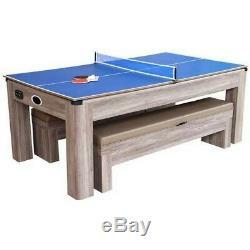 The item "Driftwood NG1137H 7-ft Air Hockey Table Tennis Ping Pong Combo Set with Benches" is in sale since Friday, November 16, 2018. This item is in the category "Sporting Goods\Indoor Games\Air Hockey". The seller is "competitiveedgeproducts" and is located in Saint Charles, Illinois.